History Salvaged and HistoryPens.com, LLC (HS) began with a simple goal: the reclamation, salvaging and repurposing of wood and other natural materials from historic sites throughout the United States that would otherwise be discarded and lost to history. HS works primarily with wood and timbers removed from historical buildings and sites during the renovation of existing structures as well as with trees and branches that have fallen in storms, or are removed for safety reasons or expanded construction. HS offers a historically significant, revenue producing alternative to support the ongoing operation of its client historical sites rather than the discarding and destruction of these limited, one of a kind resources, thus preserving not only history, but the integrity of the environment through the repurposing of these materials. Additionally, HS has become a resource that supports Museums, Fraternal Organizations, Libraries and private collections have utilized to monetize redundant, deteriorating and other small pieces in there collections that if not repurposed would be lost to history. HS, provides clients a way to directly benefit from our unique model of giving these otherwise wasted resources new life by repurposing materials from historically significant structures and sites and realizing incremental revenue through HS’s donations, acquisition and/or royalty programs. 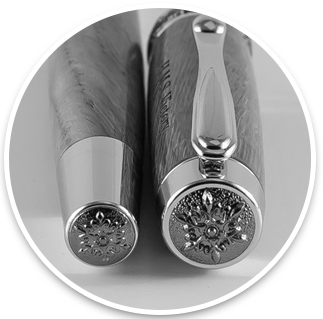 Although HS’s initial creations were limited to fine writing instruments, HS has developed a group of artists, craftsmen, gold and silversmith’s, artisans and others and expanded our Witness Wood® product offering to include picture frames, bottle stoppers, ornaments, magnets, bookmarks, furniture, artwork and other memorabilia. While touring Ellis Island several years ago we watched construction workers tossing sheets of marble out of a window into a dumpster. After inquiring about what they were doing we were told that the building was being preserved and renovated and that “we are just getting rid of the junk”. That “junk” turned out to be 100+ year old original construction marble and tiles from the hospital building that my both of my Father’s parents and both of my Mother’s grandparents spent time in when the emigrated to the United States at the turn of the 20th Century. Something just didn’t seem right about the total disregard of materials that touched and witnessed so many stories and so much history. Over the next several years we witnessed this same process being repeated at historic and cultural sites nationwide and that prompted us to find a way to repurpose some of these precious resources that have witnessed so much help “Keep History Alive” in our own small way.